Deaths of the Smallest Galaxies: Gas Stripping? It’s tough to be a little galaxy. Even back in the early universe, when galaxies went berserk and formed a prodigious number of stars—enough so their light ionized all the hydrogen gas in the universe—your gas could have been heated up, preventing you from forming stars. Should you survive an early death, you still risk passing into the vicinity of a massive galaxy, where you could readily be shredded into oblivion, with nothing but a trail of stars left marking the path you took as you were shredded to death. Far before your dramatic exit, you’d find yourself shining less and less brightly—the massive galaxy you orbit will starve and strip you of the gas you need to form new stars and stay bright. And as if these things weren’t bad enough, you’re often called one of the “vermin” of the universe because there are so many galaxies like you. The less mass you have, the more susceptible you are to death. Among the dwarf galaxies orbiting the Milky Way—which has a mass that’s 1012 times the mass of the sun, or 1012 M⊙ for short—those that are 108 M⊙ or smaller tend to have no gas and form no new stars, a type of galaxy death astronomers call quenching. The authors of today’s paper tackle this problem head on, looking at one possible cause of death: stripping. The gas within you can be blasted out by the hot wind you’d encounter when you enter the Milky Way, a process that’s called ram-pressure stripping. In addition, the movement of the fast-moving hot, diffuse gas of the Milky Way against the relatively slow-moving, cool, dense gas within you can cause your gas to billow and plume out due to gas instabilities, causing you to lose even more gas—a process called viscous stripping. How close to death can stripping push a little galaxy? They took real galaxies that have been observed far, far away from a massive galaxy, out in what we call the “field,” whose gas distributions have been measured. They then calculated what would happen as these dwarfs fell into the Milky Way. First, they estimated the amount of gas that would be stripped via ram-pressure. They then calculated the amount of gas that would be lost due to viscous stripping in a billion years, the time it appears to take to quench the Milky Way’s dwarf galaxies. They found that ram pressure stripping was effective for galaxies less massive than about 108 M⊙, but failed to remove the gas in more massive dwarfs—reproducing the cutoff seen in the Milky Way’s dwarfs. Those below this cutoff lost as much as 40% of their gas on average. When they took into account viscous stripping, they found that the gas lost in the least massive dwarfs could rise to about 70%, almost double the amount removed just by ram-pressure. The most massive dwarfs were not immune to viscous stripping, and lost up to 20% of their gas. In reality, many of the dwarfs in the Milky Way are completely stripped of their gas. Thus while the work by the authors of today’s paper shows that stripping can be very important in stripping dwarfs of their gas, it might not be the only gas-removal process at work. Also, their calculations were fairly rudimentary: they assumed that the Milky Way’s mass distribution was perfectly spherical. It’s mass could be rather clumpy, which can increase the amount of gas that’s stripped. It’s possible, too, that the dwarf galaxies are less dense than we think they are. There’s evidence that dwarf galaxies have cores of constant density, in contrast to one that gets more and more dense towards the center, as the authors assumed, which makes it easier to strip a dwarf galaxy’s gas. Only future calculations will tell whether stripping can solve the dwarf galaxy quenching mystery! 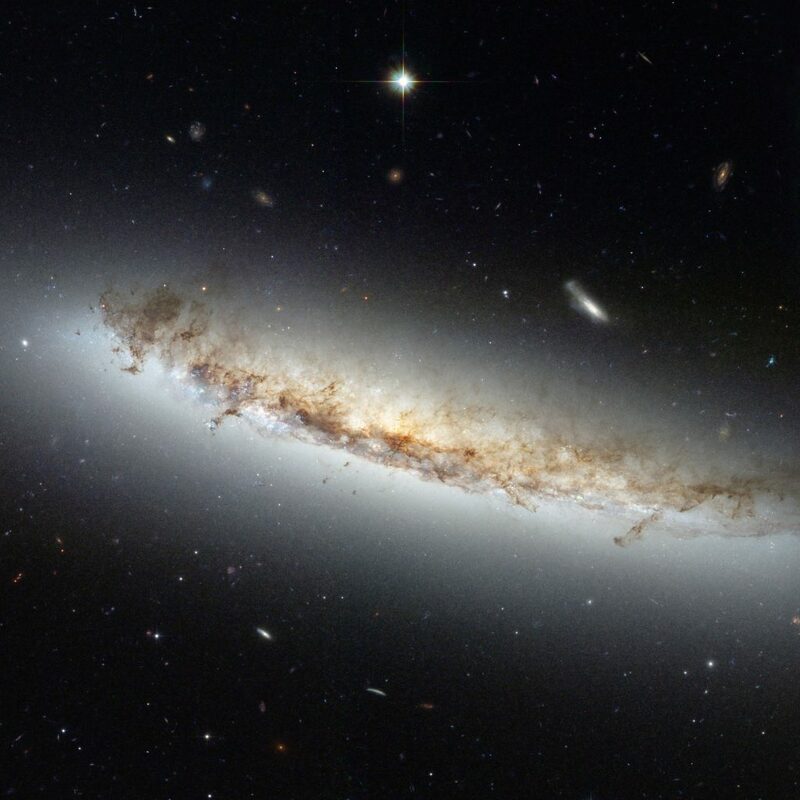 Featured image: NGC 4402, a spiral galaxy in the Virgo cluster with evidence of ram pressure stripping.